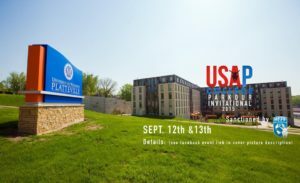 September 02, 2015 /24-7PressRelease/ — The WFPF is proud to announce the first ever USAP National Collegiate Parkour Competition which will be held at the University of Wisconsin-Platteville on Saturday and Sunday, September 12th and 13th, 2015, in cooperation with local Parkour Team Avialae. The Parkour leader at University Wisconsin, Platteville that is helping make this happen is WFPF affiliate athlete, Conner Hjellming, a junior criminal justice major from Byron, Minn., and president of the Parkour Club on campus. His goal is to bring Parkour to the forefront as a sport just like any other sport, and through this event, he is making that happen. He worked with the WFPF/USAP and his college administration to get this competition off the ground. Part of his journey was getting the UW Platteville Parkour club officially recognized by the university last year. The club currently has 30 registered members who train five days a week. Both Thompson and Bevine agree “Doubly” that the Milano twins, Matt and Greg, were the perfect partners to help jumpstart the USAP College community around the United States and their efforts helped lay the groundwork for this inaugural collegiate competition at UW Platteville. The event will run from 1-8 p.m. Sept. 12 and noon-7 p.m. Sept. 13. On Sept. 12 the course will be a non-competitive Parkour jam for qualified participants over the age of 18. This will take place at the outdoor track near Williams Fieldhouse. September 13 is the day of the inaugural Collegiate Parkour Competition, featuring the official WFPF gameplay. Public admission for one day is $10 or $15 for the weekend. Cost for UW-Platteville faculty, staff or students with ID for one day is $3 or $5 for the weekend. (details and complete schedule below). USA Parkour (www.USAParkour.org ) and the World Freerunning Parkour Federation (www.WFPF.com) is sanctioning the competition. Professional parkour athletes from WFPF will serve as judges during Sunday’s competition. Participants will compete in three categories including speed, a challenge round, and a freestyle round. More than 10 collegiate teams from around the United States have been invited and Hjellming is hoping for a big crowd of spectators to help make this historic event a big success. The WFPF recently partnered with American Eagle Outfitters for their Flex Denim jeans launch which can be seen in all their stores internationally as well as in a Times Square Jumbo-tron video. Part of this campaign also included a Funny or Die Parkour spoof of the AEO Flex Denim campaign starring “New Girl’ and “Jurassic World” actor Jake Johnson. The World Freerunning Parkour Federation is dedicated to the safe and respectful advancement of the Parkour Movement throughout the world. Inspired by the creativity and mental discipline embodied by Parkour, the athlete/founders of the WFPF and their partners will faithfully bring this philosophy of movement to the growing numbers of optimistic young people around the globe who believe that through camaraderie, self-expression, and service to others, there is no obstacle that cannot be overcome.